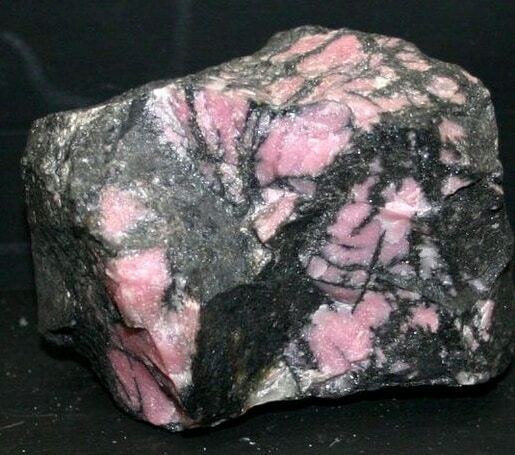 Rhodonite is a translucent to opaque pink to reddish color gemstone with patches or veins of black throughout. Usually cut en cabochon or drilled for beads. The name is derived from the Greek rhodon meaning rose. Gem Reference Guide, Los Angeles: Gemological Institute of America, 1988. Pp. 201-202. Newman, Harold. An Illustrated Dictionary of Jewelry, New York: Thames and Hudson, 1981. Pp. 257. Schumann, Walter. Gemstones of the World, New York: Sterling Publishing, Co., 1977. Pp. 168.